North Korean leader Kim Jong Un kicked off an official visit to Vietnam Friday, three days after arriving in the country for a nuclear summit with US President Donald Trump that ended deadlocked. 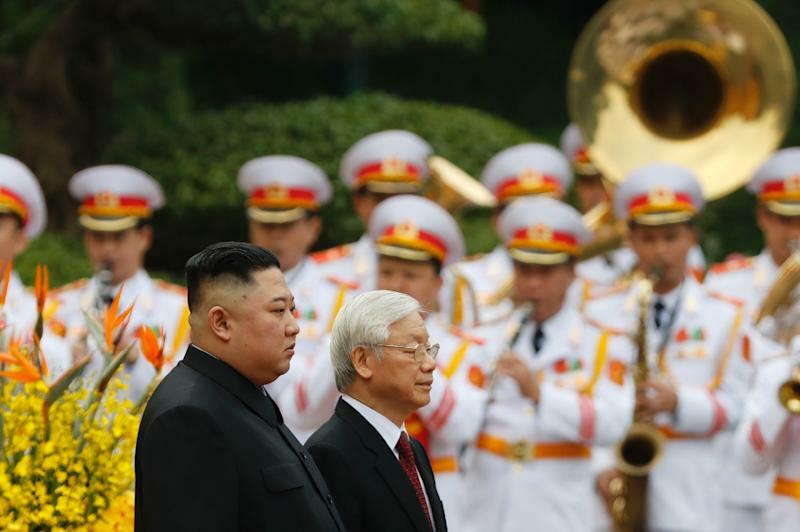 Kim put aside the troubled negotiations for the pageantry of a formal diplomatic occasion in Hanoi, where -- accompanied by his sister and close aide Kim Yo Jong -- he was received by Vietnam President and Communist Party chief Nguyen Phu Trong. The smiling leader walked before rows of children waving Vietnamese and North Korean flags outside the mustard-yellow colonial-era Presidential Palace, before inspecting an honour guard. The long-isolated North is increasingly seeking to portray itself as a country like any other, and Vietnam is Kim's fourth foreign destination in less than 12 months, after not leaving his borders for more than six years following his inheritance of power. He has travelled to China four times for meetings with President Xi Jinping, walked across the border with South Korea for a summit with President Moon Jae-in, and went to Singapore for his first summit with Trump. But for protocol purposes Kim's trips do not rank as state visits, as he is not North Korea's head of state -- his grandfather Kim Il Sung retains the title of Eternal President even though he died in 1994. Instead Kim is officially chairman of the ruling Workers' Party of Korea and chairman of the State Affairs Commission, although he is most commonly referred to as the "Supreme Leader". The North's state KCNA news agency described it as an "official goodwill visit" to Vietnam. Curious onlookers lined the streets Friday to catch a glimpse of Kim -- the first North Korean leader to visit Vietnam since his grandfather in 1964. "The summit failed. I don't know how much Vietnam has spent on this, but it must be a lot," Hanoi resident Tu Mai, 40, told AFP. The North Korean leader later met the head of the southeast Asian country's rubber stamp parliament, Nguyen Thi Kim Ngan, telling her that the warm relationship between their nations was established by Kim Il Sung and Vietnam's revolutionary leader Ho Chi Minh. "I was deeply moved by the fervent welcome from the Vietnamese people and felt our 70-year history of friendly ties," Kim said. During the Cold War, Vietnam and North Korea were both members of the Communist bloc, with Pyongyang sending Hanoi pilots and psychological warfare specialists to help it in the Vietnam War. Hanoi has since embraced market economics and been rewarded with rapid growth, while it now counts the US as an ally. Kim is expected to lay wreaths at the Ho Chi Minh mausoleum and war martyrs monument on Saturday ahead of his planned departure by train for the marathon return journey home. Kim undertook a 4,000-kilometre (2,500-mile) two-and-a-half day rail journey through China to Vietnam to attend the summit. The streets of Hanoi have been lined with heavy security along with military equipment and armoured vehicles for the summit, and some said it was exhausting work. "It's tiring, we've been on high alert for two weeks now," a police officer told AFP. "I really wish it would end soon as it really disrupts people's lives."